Henry Winkler was in my dream last night. He was helping me and I was tempted to call him "The Fonz" but thought probably everyone thinks they are being all creative and cute and call him that. He was being so nice to me, helping me out while being kind and friendly! The Fonz was my buddy, if only in a dream. I was inclined to point out his celebrity and how much I loved Happy Days, and his black leather jacket, and Jonie and Chachi and his motorcycle, and Pinkie Tuscadero ... do you see how difficult it was NOT to say something to my pal Henry? 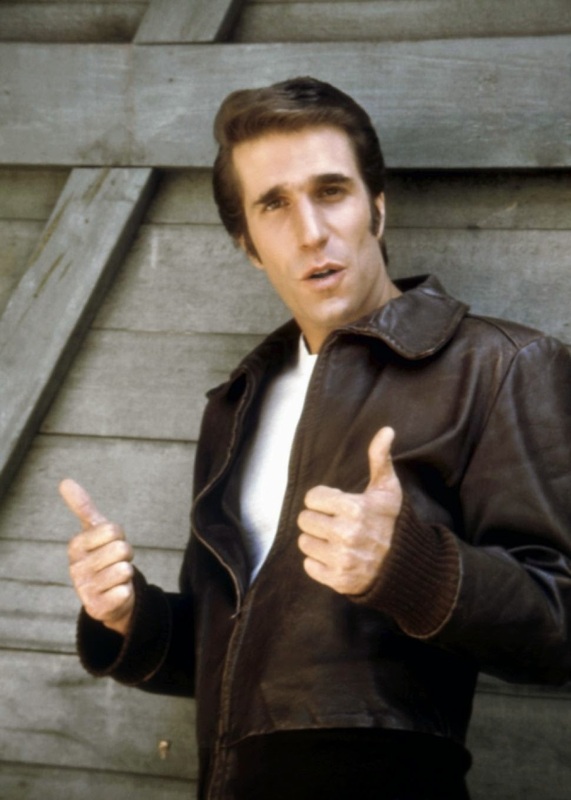 The Fonz was big part of my childhood, a weekly staple that defined some very important "kid years" for me. Know what else was? Candy. Yes, Candy. Back in the 1970's you really only needed a quarter and you were set. A whole paper dollar? That was a huge amount of dough to have in pocket and one needed a small brown bag to hold all that sugar-loot. Growing up in Glendale, my buddy JoAnne and I would buy candy every day after school and I have the cavities to prove it. When we lived at Silver Strand Beach we walked to Beam's Market and stocked up on Lemonheads, Boston Baked Beans, Red Hots, Razzles and Double Bubble - the rectangular kind that included a comic. Didn't every kid smoke candy cigarettes back then... before we learned about harmful side effects? As children, we also had a favorite liquor store at Oxnard Beach that Miss Piggy and my cousins renamed "Licky Store" and we created a song that we sung on our parent-less walk, arms locked together, skipping down the street ... "Lick, Lick Licky Store. We're coming back to buy some more!" When we moved to Camarillo in 1978, Sprouse Ritz was a bike ride away and they had the most amazing candy counter - Abba Zabba, Pop Rocks, Charms and Charleston Chews were some of my favorites. Do you remember that JC Penny even had a candy counter back in the day? I loved their sour balls! And don't get me started on walking through Farrell's candy section after a nice big ice cream meal. Remember their gigantic jaw breakers you licked for six months, only to make a small dent in that handheld sugar planet? With my extensive "Candy History," it should be no surprise that my inner child burst with fruit flavor when we visited the Sweet Shoppe in Big Bear Village. This place had a bubble machine attached to the roof and colorful gigantic "hand" chairs in front that you wanted to lick. Big barrels of taffy (even buttered popcorn flavor) and a gillion other wax-paper wrapped delights boasted their own room in this palace. The Sweet Shoppe had classic candies that my kids had never had the joy of polluting their mouths with ... Necco and Chick-O-Stick, to name a couple. Adrenalin kicked in as together we filled our cellophane bag with a little of everything our mouths told us to grab. It ended up being a $32 bag of candy, but it's an indulgence I don't regret. This was the biggest candy store I have seen and I caught a sugar buzz from the rich, bright hues and smells that filled my nose and peripheral vision at very turn. I can only compare this juvenile and magical experience to having a dream where "The Fonz" is your friend. Unreal. Did I mention The Sweet Shoppe also had a Gelato counter? I know, I know. Sugar is poison for our bodies. As an adult, I understand the consequences sugar brings. But still, even at forty-six, I am weak to the candy shop experience and "The Fonz."